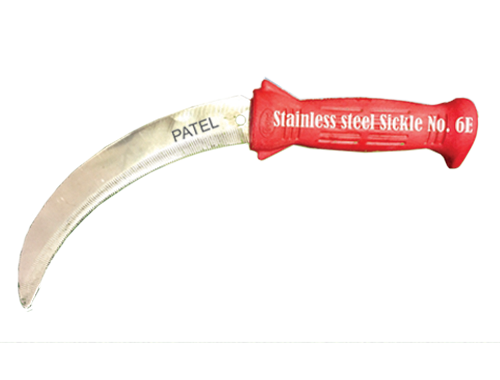 Kismat Welding Works is a Quality stainless steel sickle manufacturer & supplier in India. 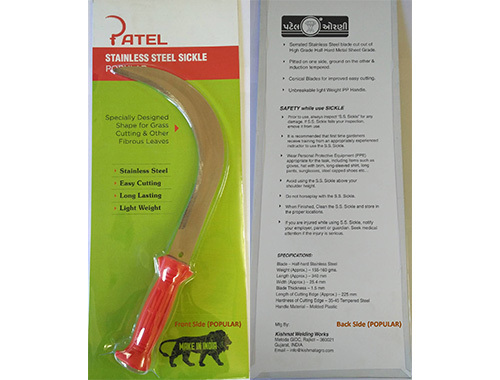 We also export stainless steel sickle. Blade made from high Quality Pre Hard & Tempered Stainless Steel Half Grade Material which is more durable compare to Alloy Iron Steel Grade. In Half- Hard Stainless Steel Sickle the number of teeth per 1inch is 20 so that at time of use the work is done smoothly and easily, not to give more presser on hand. In Iron Steel Sickle the number of teeth per 1 inch is 16 so that compare to Stainless Steel Sickle the smoothness during use is not so better & while cutting give presser on hand and user will feel stress and difficult work out a day. If the number of teeth will increase in iron sickle than life of sickle will decrease because of iron steel material comical formulation is not high graded compare to Half-Hard Stainless Steel 202 grade material. In Half Hard Stainless steel Hand Sickle the material tempered is same and equal in each & every porcine of blade because the raw-material is itself pre tempered in beginning only. While in iron steel Sickle the tempered process will done after compulsion, so that level of tempered will differed from piece to piece so if more tempered sickle than there is chance of break down if it is full from little height only, If lesser tempered than within hour or a day the teeth will gone. So this type of problem will not face while using Stainless Steel Hand Sickle. The material of Half Hard is same as the material of knife which will us in our routing life. 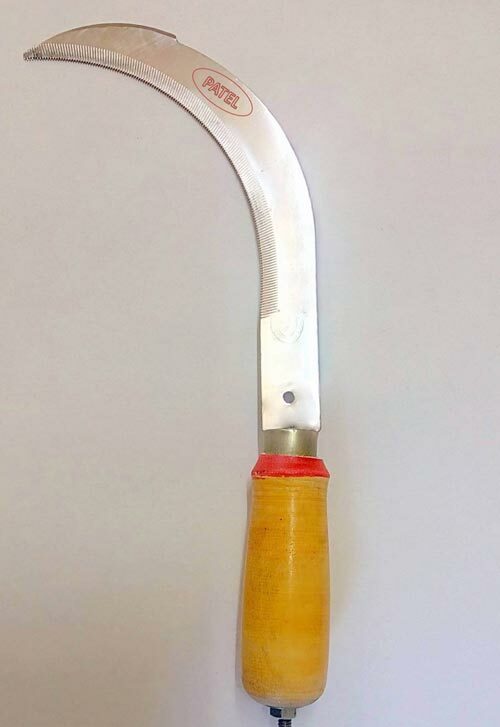 So life of the Stainless steel Hand Harvesting Sickle will depend on how you are using, if you are use Stainless steel Hand Sickle cutter in cutting of wooden ply, Heavy branches, iron wires and so on than the life of Sugarcane Knife cutter may decrease. The use of the Hand Harvesting Sickle use to cut grass during gardening and farming so on… that why proper use of product increase the life and durability. 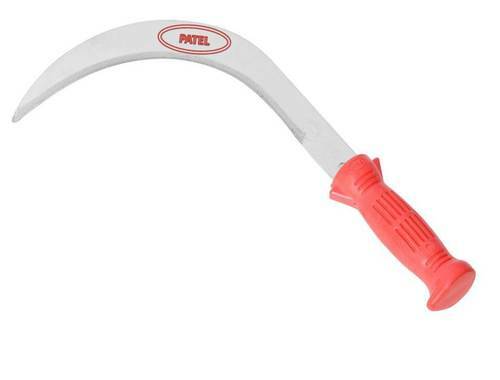 In our Stainless Steel Hand Sickle cutter handle is made of PP Plastic grade material which is unbreakable in nature and high in quality and more durable than wooden Handle and regular plastic Handle. 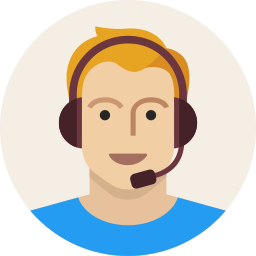 In regular use the handle will not be break but if you put press on handle though hammer or heavy stone or material than it might break. Given a better grip while use. Avoid storing Hand Sickle in wet place for longer time. Not to put in water for longer time because Half- Hard Stainless Steel Hand Sickle is tempered material having part of Carbon in material while carbon attract rust after longtime use. 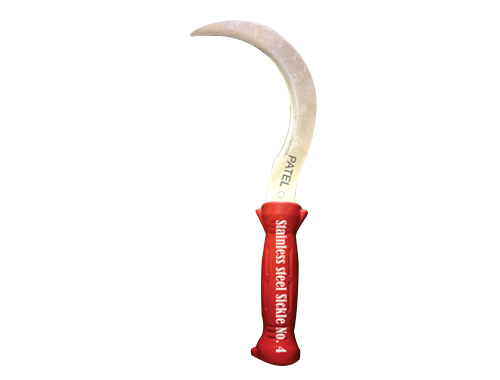 First time user must have to receive training from experienced instructor while using Hand Sickle.